May Breakfast Program: ​"Today's Business Etiquette"
If there is one thing everyone can use a refresher course on, it's business etiquette. Often times etiquette mistakes are not intentional, but can be perceived as rude. Do tend to interrupt others? Or forget to introduce people? Does your phone ring during meetings? Don't be that person! Perform at the top of your game in every level of business and learn "Today's Business Etiquette". We welcome Cindy Brown from Hello West Michigan to update and refresh us on this important topic. ​​Cindy Brown serves as Executive Director for Hello West Michigan, a talent and retention Initiative promoting West Michigan as a great place to live and work., The Right Place, Inc. Cindy Brown serves as the Executive Director for Hello West Michigan, a talent attraction and retention initiative promoting West Michigan as a great place to live and work. The organization, which helps member companies increase their rate of success in recruiting top talent, is the only organization of its kind in the country. Under Cindy’s leadership, Hello West Michigan has grown its membership, programming, and regional awareness, helping establish West Michigan as a destination for top talent. Through Hello West Michigan’s strategic partnership with The Right Place, Cindy also serves as the Vice President of Talent Initiatives and collaborates with other talent related organizations to address regional talent pipeline challenges. 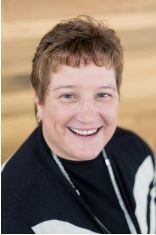 She has over 20 years of leadership experience in recruiting, employee development, training, and facilitation. She excels at attracting talent, generating awareness, and connecting individuals to resources. Cindy’s work in the community extends beyond Hello West Michigan. She also serves on West Michigan Works! Workforce Development Board, Goodwill Industries of Greater Grand Rapids Board of Directors, Aquinas College Career Services Advisory Board, West Michigan’s 101 Best and Brightest Companies Advisory Board, and is a Past-President for the Michigan Career Educator & Employer Alliance. Cindy received her Bachelor’s Degree in Business Administration from Aquinas College.